If Kevin Schwantz’ prediction that Ben Spies will win at least one race in his rookie year is to come true, this weekend may be his best chance. Spies knows the Indianapolis track well. When MotoGP visited there for the first time in 2008, he was on the grid (guest riding for Suzuki) and finished the race in sixth position. Remarkable, really. Although Spies has been pretty quick on tracks he has never seen before, his familiarity with Indy is a plus, as is the fact that the race is close to his Texas home. Another factor? With Rossi leaving Yamaha, Spies might start getting the “good parts” from the factory team. Unlike Rossi, Spies was given a 2011 prototype M1 to practice on during testing after Brno. You can bet that the support of Spies will step up during the remainder of this MotoGP season. 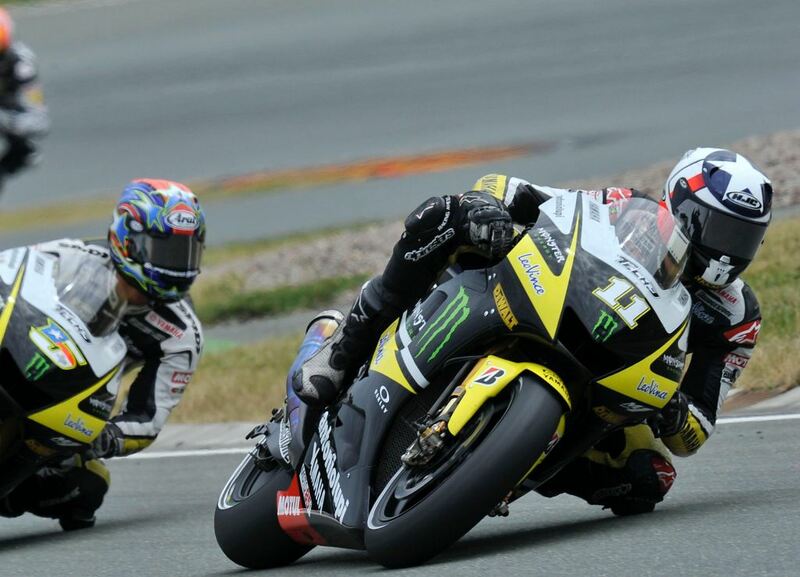 Another factor has to be Spies recent performance, and his increasing confidence running with the MotoGP “aliens”. He came close to taking pole position during the last round (ultimately gridding in the second spot) and finished just off the podium in fourth. With his confidence high, his recent performances, and the added incentive of riding in his home country in front of family and friends, this just might be Spies last chance this year to take the top step of the podium. Is the U.S. Ready to Embrace Adventure Bikes? He’ll win, or not. Yawn. He’ll win it or bin it trying. I’m sure he’ll have all the best factory pieces, and a fresh race engine with all the revs they can give him. The factory has alraedy made the committment to him for next year, so why not give him all the support he needs. Too bad for Colin, but he hasn’t been willing to step it up the past season or two. He looks like he’s riding into retirement. Colin doesn’t deserve the best pieces, they’d be wasted on him anyway. I agree this is his best chance. I was at Laguna and he was catching Rossi before he messed up in turn 11 before the start/finish. He finishes hard so if he is up front this could be the one. He might see a podium but not a win … he’s almost but not quite there! Yes he will get SOME parts, but you can be sure they won’t give him enough to beat their factory bike. He’s still a support team rider. Anythings possible, but if Jorge is on his game I don’t see it happening. Still, a podium on a satellite bike would be VERY impressive. I don’t know.. I think he will be on a more even playing ground.. I think I heard that they (Yamaha Factory) gave him additional RPM’s for the Laguna race and they just might do the same for him here.. If that is the case I know he has spun laps on this circuit so he knows it and he has a great chance… If I were a betting man I’d put a few dollars on him but I wouldn’t mortgage the farm.. I don’t think it will happen as long as Lorenzo is in the race. Maybe next year……. The assertion this article makes is based on emotion. Spies will be lucky to finish 5th. His best chance at winning one of the remaining races this season will come at Aragon. His ability to quickly learn tracks, as confirmed by his podium at Silverstone, combined with a team strategy that hopefully has him running one of his few, remaining fresh engines, will be his best opportunity to finish first this season. Vale, Dani, Jorge, and Nicky have all shown great speed at Indy in the past. It would be nice for Ben to prove me wrong! I feel that that if Vale can win this race and Dani can start showing some real consistency, the championship will begin to be heavily contested. Be there or be square. Indy MotoGP! I plan to be there. MotoGP rocks. I see it the opposite. Spies has always been a strong finisher. He usually seems to have more at the end of the race than the other guys. Maybe that’s conditioning or his mindset, who knows? I see that the bike has been the limiting factor this year for him. The satellite M1s have been noticeably down on power, all the riders have said so. If he starts getting ungrade parts, all bets are off. Although, it’s not really fair to Edwards if only Spies gets the good stuff. I know Spies is going to factory next year, but Yamaha should at least give the satellite boys even treatment. Hell yeah he is going to win. Jorge 2nd, Nick 3rd. Just don’t think he has enough for Jorge for race distance yet. But, he’s learning so much every race he’s in there with them for the 1st part of the race.